"Complementary translations encourage in-depth study of the Scriptures"Bible study leaders, Scripture students, preachers, and people curious to see their favorite biblical texts in different translations will benefit from this volume. The same set of verses from both the NKJV and the Amplified Bible appear in side-by-side columns on each page, making for effortless verse comparison. 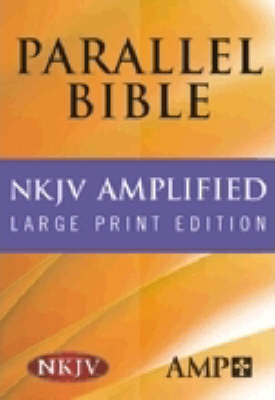 And, readers will appreciate this edition's easy-to-read type, which is larger than that used in other parallel Bibles.FEATURES- 9.4 point type- Black letter textNEW KING JAMES VERSIONCompletely updated, this translation remains faithful to the accuracy and beauty of the KJV, yet uses contemporary, readable language.AMPLIFIED BIBLEDisplaying additional words that communicate shades of meaning in the original text, this translation expands the reader's understanding of the Scriptures.